The What: QSC introduced the TouchMix-30 Pro, 32-channel digital mixer, with immediate availability in select markets. The What Else: With 32 mixing channels (24 mic/line, six line, stereo USB) and 16 outputs, the TouchMix-30 Pro offers signal management flexibility for a wide range of applications. Beyond offering a higher channel count than its predecessors, a host of additional, new “Pro” features sets TouchMix-30 Pro apart from its smaller TouchMix Series siblings. 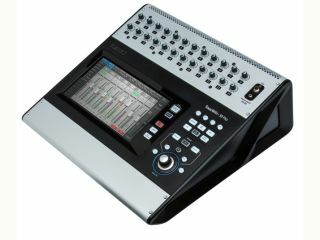 Features include a large (10-inch) multi-touch screen for more on-screen information while also providing greater hands-on control; Anti-Feedback and Room Tuning Wizards to simplify complex equalization tasks; two real-time analyzers (RTA) that provide instantaneous analysis of channel tonal balance and room response; touch-and-route patch matrix for easy “multing” and rearrangement of inputs; eight sub-groups with six-band full parametric EQ, variable high-pass and low-pass filters, and limiter that may be linked for stereo; 32-channel direct-to-hard-drive record/playback mode to capture and recall performances without the need for an external computer; 32-Channel DAW interface with Apple computers, allowing for bidirectional I/O with popular workstation software; and MP3 playback direct from USB. Additionally features include 24 class-A microphone preamps to deliver studio-quality audio; more than 120 live instrument, microphone, and other audio source presets created in live environments that provide mix-ready channel settings; 1/3 octave graphic equalization and six-band parametric EQ plus limiters, delay and 12-band notch filters; 14 mono mixes that may be paired for stereo while two pairs of Auxes can drive wired in-ear monitors (IEM) directly; and six stereo effects processors plus pitch-correct for studio-grade signal enhancement without sacrificing auxes or additional channels. The Bottom Line: Well suited for production professionals, musicians, and bands as well as live performance venues, TouchMix-30 Pro is a compact digital mixer with features and functionality for demanding professionals, with an intuitive workflow for users at every level of experience. The TouchMix-30 Pro is available immediately in select markets worldwide. List price is $2,359.99 with a U.S. estimated street price of $1,899.99.